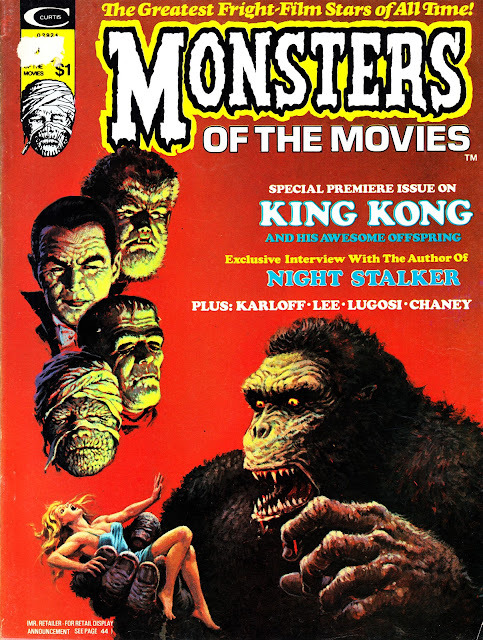 From June 1974: the debut issue of Marvel's MONSTERS OF THE MOVIES magazine, an obvious me-to attempt to cash in on the ongoing success of Jim Warren's FAMOUS MONSTERS OF FILMLAND. The magazine boasted colour covers with black & white interiors on the cheapest possible paper, ideally unsuited for reproducing movie stills with any clarity. It was published under the Curtis rather than Marvel brand. The brand was finally phased out circa 1980, by which point Marvel only occasionally dabbled into the magazine realm. Despite the long running success of the Warren book, Marvel couldn't make this one stick and they pulled the plug, in 1975, after a mere eight issues. The title bounced back one final time with an annual (AKA issue nine), boasting a great Spock cover, which I've posted previously. Although the interiors are underwhelming, and don't feature any comics material, the covers are universally gorgeous: supplied by Luis Domingquez and Bob Larkin (with Gray Morrow stepping in for the annual). SFX has a lovely shiny X-files cover although I think this one missed quality control at the printers. Every copy I examined had loose pages. CRIME SCENE issue 2 is out also. STAR WARS COMIC SAMPLER - a lovely freebie in FP courtesy of PREVIEWS. GUIDE TO COLLECTING LEGO SETS - a very nice book with lots of pages on star wars lego. BLACK PANTHER VOL 2 - is it just a co-incidence that this came out just as the first pics of BP in the CIVIL WAR movie have been released ? Either way, a very nice collection of stories. Re: Back Issue and Alter Ego. This may be irrelevant but off the top of my head I believe these ship ten issues a year rather than 12/monthly, which may account for the apparent lack of recent new issues. The last BI I picked up was the Supergirl issue which was probably about 5/6 weeks ago ...? You are correct krusty, they have quite an erratic publishing schedule. There can be a long gap and then two come out only a few weeks apart.